Julie Bishop North Korea nuclear threat on Australia response. Julie Bishop responds to North Korea's threat of nuclear strike on Australia. 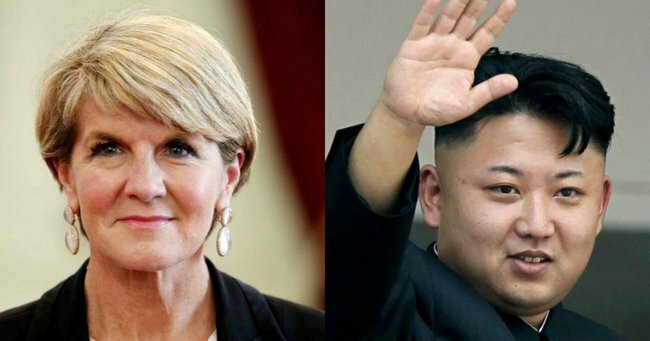 Foreign Minister Julie Bishop has hit back at North Korea over its threat of a nuclear strike on Australia saying Pyongyang should be investing in the welfare of its “long-suffering citizens” rather than weapons of mass destruction. “If Australia persists in following the US moves to isolate and stifle the DPRK and remains a shock brigade of the US master, this will be a suicidal act of coming within the range of the nuclear strike of the strategic force of the DPRK,” Pyongpang said. Undeterred, Ms Bishop told AAP on Sunday that North Korea’s threats of nuclear strikes against other nations further underlines the need for the regime to abandon its illegal nuclear weapons and ballistic missile programs. North Korea’s state-run KCNA news agency on Saturday night quoted a foreign ministry spokesman accusing Ms Bishop of “spouting a string of rubbish against the DPRK over its entirely just steps for self-defence” and Australia of “blindly and zealously toeing the US line”. It said Ms Bishop had “better think twice” about the consequences of her “reckless tongue-lashing”. Ms Bishop said last week sanctions would send “the clearest possible message” to North Korea that its behaviour would not be tolerated. Australia’s sanctions North Korea’s latest missile test fizzled last weekend, but it conducted two nuclear test explosions and 24 ballistic missile tests last year. Mr Pence praised Mr Turnbull for publicly calling on China to do more to pressure North Korea. Labor’s defence spokesman Richard Marles said on Sunday North Korea’s latest statement was a matter of enormous concern, but noted Pyongyang had made similar threats to other nations, even a veiled one at China. But he did not believe conflict on the Korean peninsula was particularly likely and backed the approach the US has taken on North Korea. “I do think a harder edge being presented by America in respect of North Korea is not a bad thing,” Mr Marles told Sky News. He believed the early signs coming out of China, an ally of North Korea, were positive, it saying if the problem is going to be dealt with it needs to be through “China, America and the whole world”.